Transparency Market Research (TMR) has published a new report titled, “Viral Vector & Plasmid DNA Manufacturing Market - Global Industry Analysis, Size, Share, Growth, Trends, and Forecast, 2019–2027”. According to the report, the global viral vector & plasmid DNA manufacturing market is expected to exceed a value of US$ 400 Mn by the end of 2019. The global market is anticipated to surpass US$ 2 Bn by 2027 and expand at a high double digit CAGR from 2019 to 2027. Rise in prevalence of cancer, genetic disorders, and increase in number of clinical studies are expected to augment the global market from 2019 to 2027. The viral vector & plasmid DNA manufacturing market is projected to expand owing to an increase in the awareness regarding viral vector based treatments and technological advancements in developing countries. According to Cancer Research UK, there were 17 million new cases of cancer in 2018 and four most common types of cancer worldwide were breast, lung, bowel, and prostate cancers, which account for approximately 43% of all new cases. According to WHO estimates, currently, 10,000 of human diseases are known to be monogenic, caused by modifications in a single gene in human DNA. The global prevalence of all single gene diseases at birth is approximately 10/1000. In Canada, it is estimated that monogenic diseases may account for approximately 40% of the work of hospital-based pediatric practice. Increased prevalence of such disorders demands improved treatments, which in turn is anticipated to propel the viral vector & plasmid DNA manufacturing market during the forecast period. Awareness regarding gene therapy is increasing worldwide, as compared to the last few decades. According to an article published by Human Gene Therapy, the acceptance of gene therapy for severe disorders, such as Alzheimer Disease, is high as compared to less severe disease, such as attention deficit hyperactivity disorder. Furthermore, acceptability of gene therapy is increasing, and there is a strong need to provide the public and patients with up-to-date information. Moreover, opportunities to engage in the discourse about areas of research in gene therapy is a priority. This is estimated to propel the viral vector & plasmid DNA manufacturing market during the forecast period. In terms of disease, the cancer segment dominated the global viral vector & plasmid DNA manufacturing market, followed by genetic disorders. The segment accounted for a prominent market share, due to availability of approved viral vector-based cancer drugs and several ongoing clinical trials for the treatment of a variety of cancers. This creates lucrative opportunity for entry into the viral vector & plasmid DNA manufacturing market. In terms of type, plasmid DNA is a highly attractive segment of the global viral vector & plasmid DNA manufacturing market, followed by the adeno-associated virus (AAV) segment. This is attributable to the extensive utilization of plasmid DNA as raw material in the manufacturing of various viral vectors. Furthermore, several studies have emphasized the benefits of DNA- based vaccines over conventional vaccines. The adeno-associated virus (AAV) segment is anticipated to expand at a considerable CAGR during the forecast period, due to several advantages offered by AAV over other vectors, making them the vector of choice for various clinical trials. 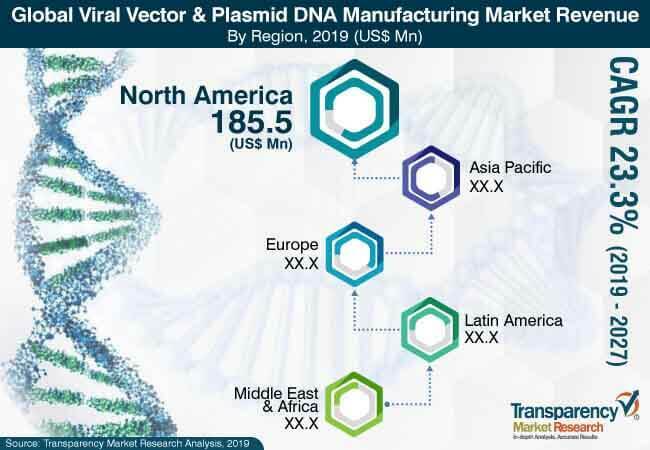 North America dominates the global viral vector & plasmid DNA manufacturing market due to a large patient pool, technological advancements, and high acceptance of advanced treatments in the region. The region is estimated to maintain its dominance during the forecast period. Moreover, rising healthcare expenditure, availability of approved gene therapy treatments, and increasing investments are key factors that are anticipated to boost the viral vector & plasmid DNA manufacturing market in the next few years. The viral vector & plasmid DNA manufacturing market in Asia Pacific is projected to expand at a notable CAGR due to increasing awareness regarding viral vector based products in developing countries and rising research initiatives in countries such as Japan and China. Major players operating in the viral vector & plasmid DNA manufacturing market include CobraBiologics, Novasep Inc., Cell and Gene Therapy Catapult, Kaneka Eurogentec S.A., FUJIFILM Diosynth Biotechnologies Inc., Spark Therapeutics, Inc. Merck KGaA, uniQure N.V., and Lonza.